A mezzanine is, strictly speaking, an intermediate floor in a building which is partly open to the double-height ceilinged floor below, or which does not extend over the whole floorspace of the building. However, the term is often used loosely for the floor above the ground floor, especially where a very high original ground floor has been split horizontally into two floors. Mezzanines may serve a wide variety of functions. 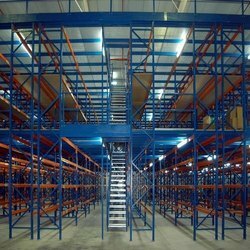 Looking for warehouse Mezzanines ?